Where to begin. First I have to say for a new series this one is gonna be 'Killer'! From the first page I was drawn in and I could not put this one down. I was cheering Alex all the way! While she desperately tried to figure out what the heck was going on I felt I was one step ahead of her yelling 'Go girl.' Being a person of interest in a murder isn't a great way to start a week. And then as the week goes on things get worse as Alex becomes a prime suspect. And then the victim when the wife of the deceased decides Alex is the murderer because she is 'the other woman'. Things seem to go from bad to worse when her younger brother and his wife(?) and puppy appear on her doorstep. Followed shortly by their Russian grandmother when she hears all the drama on the news. But there just might be a little light at the end of the tunnel and maybe a little glimmer off hope in the form of the hot new neighbor across the street. Who is turning his house into a B&B. There are some great characters running around and helping Alex out. There are also a bunch of suspects. Dana did a great job of introducing everyone and the story just flowed. Dana's family even the ones that aren't around are introduced and flow into the story. They'll be a big part I expect of future installments. There's another brother living in NYC who sends money to help Dana out. The super model sister who now owns a modeling agency and is in Paris with the mom. Thank goodness for that mom home during a murder investigation would have driven everyone nuts. Dana's brother went from being dead broke and out of a job to pastry chef for the new B&B. The girlfriend was quite the # a waitress he met in Vegas. She turns out to be a good sleuth and very willing to help solve the crimes. If I had to choose a favorite character it would really be hard. I loved them all. From the grandmother who was a bad cook but could take out the bad guys with an iron skillet. To Alex's best friend Trip. He was a great guy and always ready to help except when asked to pretend to be Alex's fiance. As much as he loves Alex as his best friend it's not in the cards. He already has a partner that I expect we will meet in future installments maybe. He was left completely out of the drama and only mentioned in passing. Hmm what might be up with that? Ian the new neighbor is British and charming and is in the wings waiting to get to know Alex better. I have to say the only thing I didn't like about the story/plot was that in the end Gabby the Las Vegas girlfriend decided to return to her previous boyfriend in Vegas. She was a great part of the story and I'll miss her. Maybe she won't find true love there after all. We can only hope. Confessions of a Red Herring was filled with fun and funny characters. A good 'ole mystery(s) and a great twisty turning plot that keeps you interested all the way to the end when Grandma clobbers one of the villains with her skillet. It was a great read. I can't wait for the next one! The author included a preview of Seeing Red. How long do we have to wait? 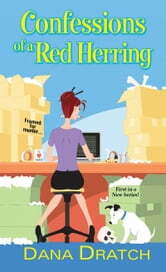 Confessions of a Red Herring is a 5+ Stars Start to a new Cozy Series I received a complimentary copy. First book in A Red Herring Mystery series! Confessions of a Red Herring by Dana Dratch is the first book in A Red Herring Mystery series. Alex Vlodnachek is a former reporter now working at the D.C. public relations firm of Coleman and Walters. After an incident with managing partner, Everett P. Coleman on Friday, Alex decided to call in sick on Monday. She is surprised when two detectives come knocking on her door to question her about Everett’s murder and Alex is their prime suspect in his death. When Alex goes into work, she is promptly fired. As if her week could not get worse, her younger brother, Nick shows up looking for a place to stay with Gabrielle, his new lady friend from Vegas, as well as a puppy named Lucy. Then Baba, her Russian grandmother, arrives which means inedible cooking (they will have to sneak in snacks). To escape the chaos in her tiny home and clear her name, Alex puts her investigative reporting talents to work. Coleman and Walters is working overtime to throw Alex under the bus in the court of public opinion. Who inside the agency wanted Everett dead? The wife, the business partner, and the mistress are all viable suspects. Someone, though, is attempting to thwart Alex with unscrupulous tactics (stealing her mail, turning off her electricity). Can Alex expose the killer before her death is the next media sensation? Confessions of a Red Herring is full of off-beat characters. Alex is spunky go-getter. She is not going to let the PR firm set her up for murder. Nick, the younger brother, goes from one job to another. He does not know what he wishes to do with his life. His last venture (an emu farm) was sabotaged by his pot smoking partner. Gabriele is Vegas waitress that Nick picked up on his way to Alex’s house. She is a pickpocket with a questionable online business. We have Lucy the puppy who is destructive with Alex’s belongings. Baba, the Russian grandmother, who cooks grey, slimy food (the descriptions will put you off your next meal). I wish the author had taken the time to establish her main character and provide a thorough backstory. The book consisted of one madcap incident after another. The murder occurred in the first chapter and solving it was a snap. There was a great deal of speculation and repetition of details (not needed). My favorite scene in the book was the showdown at the unemployment office. I found it entertaining. The description of a banks fee system was spot on. My rating for Confessions of a Red Herring 3 out of 5 stars. I do want to mention that there is foul language in the book along with the mention of intimate scenes, drugs and copious amounts of alcohol. 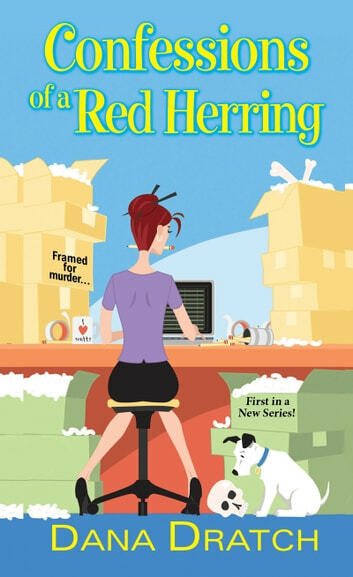 Those readers who prefer their cozy mysteries to be light and humorous, then Confessions of a Red Herring is for you.